Apartment on Lake Iseo brand new, built in 2014. This apartment is located on Lake Iseo, enjoys a fantastic view of the lake, just in front of Montisola. The apartment is surrounded by a park just 3 km from Tavernola Bergamasca and 11 km from Sarnico. Situated in close proximity and can be reached by ferry towards montisola, sarnico, Iseo. There is no more enchanting place than this, the incredible view and attention to detail in the furnishing of the apartment make it a unique and unforgettable place. Lovely apartment with an amazing view. Well equipped apartment with amazing views. We enjoyed our stay here very much and the area is beautiful. Giovanni was quick to respond with queries - we would love to return. I hope to see you in the next time. Our first time to Italy ,finding my roots . The apartment was very beautiful and the views were absolutely breathtaking . We stayed for two nights and would have liked to stay much longer after seeing the area . Giovanni was very nice and took great pride in his property ; it was immaculate . We are talking about visiting Italy again and would love to stay there . 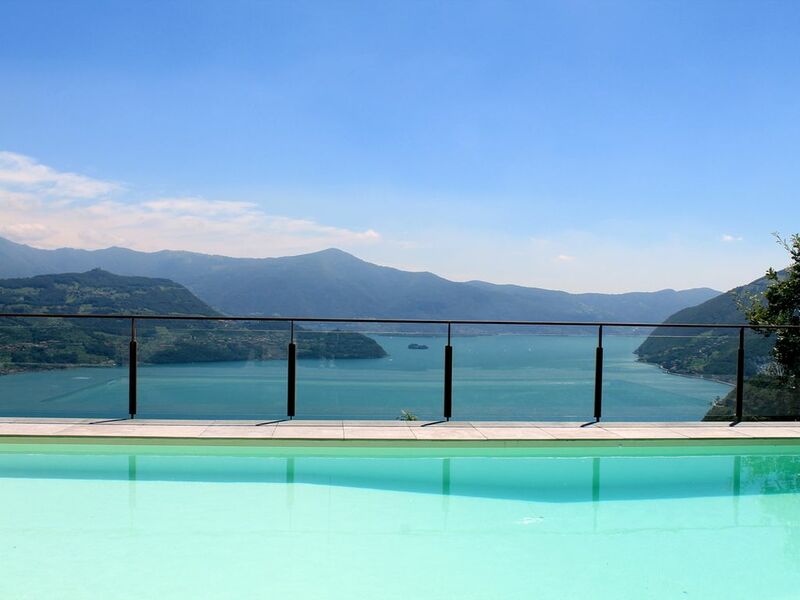 This is a modern property on lake Iseo at about 250 meters above water level which provides stunning views over the lake and Monte Isola island. The property is new and properly equipped. The owner (Giovanni) was very helpful. Despite a number of items were broken from previous tenants he dealt with issues promptly and we really did not feel any impact. Note: mounting driving experience is a great plus as last piece of road to the apartment is quite steep and narrow. Vi rejste to par sammen, og ferieboligen var mindre end vi havde regnet med ud fra billederne på hjemmesiden - vi havde ønsket to separate soveværelser. Udover størrelsen var boligen super fin, og havde en fantastisk udsigt! Området er charmerende og meget hyggeligt, og Giovanni var en vært vi altid kunne komme i kontakt med, og som hjalp os med anbefalinger om området. Desuden brugte vi mange timer i poolen og på de dertilhørende solstole. The apartment is located in the most beautiful landscapes of Italy. The view was lovely and unique. Nearby you can find every type of entertainment, but to remember are the food and wine tours in the cellars of the world's most famous Franciacorta Brut. Also for fans of golf, and skiing within 20 km you can find golf courses and ski resorts. This resort is a true paradise, very hot in summer, while in winter is very mild, but climbing the nearby mountains, you can afford a beautiful ski Montecampione Borno or less than 30 minutes from the apartment.